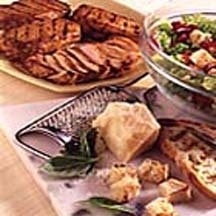 CooksRecipes has quality, kitchen-tested recipes for delicious salads featuring bread as a main ingredient as in the classic Italian panzanella salad and Southern cornbread salad. 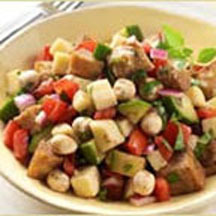 Panzanella, the classic Italian bread salad is at its best when fresh-from-the-garden, ripe tomatoes are used. 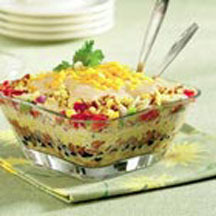 A fabulous make-ahead main dish salad. Makes a great dish for a potluck! Based on the classic Italian bread and tomato salad, panzanella, this satisfying entrée salad is a fresh grilling idea—and a meal-in-one dish.